Charm of an early 20th century mansion blended with the technology of a 21st century facility. 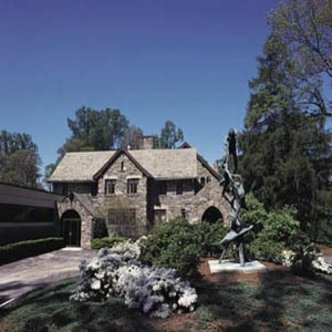 Situated amongst 32 lush wooded acres, the Montrose Mansion Villanova Conference Center manicured lawns and gardens, wooded hills, and spring-fed lake epitomizes the Main Line wealth of its era. Guests may enjoy strolling the grounds, or simply relaxing in the bar, mansion parlors, and library of the Montrose Mansion. We offer the beauty and peace of a secluded retreat, yet still conveniently located near Villanova University, Philadelphia, I-476 and I76. We offer a full service Business Center providing assistance with faxes, copying and other clerical and technical needs. Each of our well appointed guest rooms features a spacious work area, telephone, data line, high speed internet access, and private balcony overlooking our flower-laden courtyard or woodlands.